While byproducts from processing and manufacturing may seem to be a burden – creating difficult, and often hazardous, waste disposal issues and contamination – resourceful management can turn what is typically treated as garbage into an opportunity for growth and sustainability. By finding alternate uses for byproducts, producers can replace the burden of waste with benefit. Whether it be cashew shells, or coffee tree husks, businesses have found creative solutions to get the most out of the resources at hand, while supporting the communities they inhabit. Cashew nuts are an important catalyst of economic growth in sub-Saharan Africa. Africa is now the world's greatest producer of raw cashew nut, which serves as an important agricultural commodity that significantly contributes to national GDPs. Most of this production is carried out by smallholder farmers and processors, meaning this salty snack is an essential source of income for rural livelihoods. However, despite the potential to add value to their raw nut product, most cashew nut processing takes place outside of Africa. 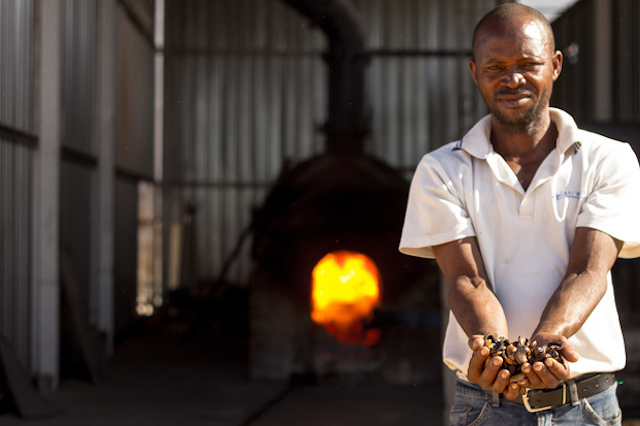 TechnoServe is working with entrepreneurs across Africa to keep more of their raw nuts’ value within their communities by removing the shells locally, a multi-step process that creates thousands of jobs, often in rural areas. As massive as the cashew’s potential is for rural and national economies, however, 70 percent of the raw cashew nut's weight is regularly thrown away in the form of its shell. Once removed, the shell is typically burned as a rough, dirty, and inefficient fuel, or is discarded as waste. By throwing out the shells, cashew processors are not only creating a complicated waste-disposal issue, but are also neglecting two potential byproducts: cashew nut shell liquid (CNSL) and the shell’s dried husk. The extracted liquid has several manufacturing uses, such as paints and varnishes, and can be sold to other industries as additional income. 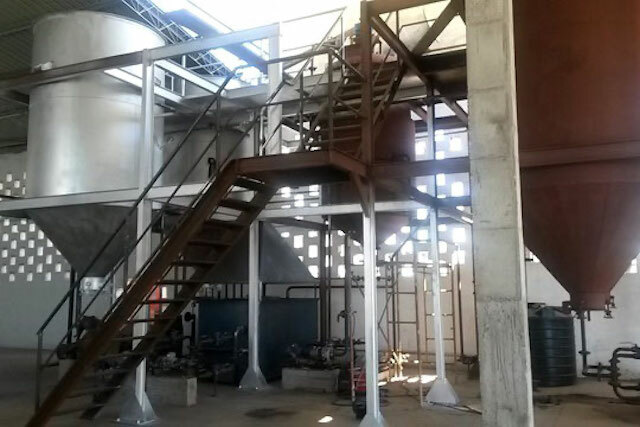 With the liquid removed, the dry cashew shell can be used as a more efficient and clean fuel, not only within the processing plant, but also for local communities. With a grant from MozaCajú, Condor bought Mozambique's first machine to extract raw cashew nut liquid, allowing them to utilize frequently discarded byproducts and diversify their production. While the business case is different for each country and even each plant – depending on the scale of their operation, electricity and diesel prices, and other factors – TechnoServe teams work with cashew producers, big and small, to generate the greatest possible impact from their cashew farms and factories. In Mozambique, TechnoServe’s MozaCajú project – which helped to improve the lives of more than 20,000 farmers and businesspeople in the nation’s cashew industry – helped the processor Condor Nuts to buy the nation’s first CNSL extraction machine. Already working with TechnoServe teams to improve their operations, Condor was awarded a matching grant for the machine after presenting their business model, and are already turning a profit from the sale of the extracted liquid. Condor has also been providing the dried “cashew shell cake” and adapted cooking stoves to their employees, providing an affordable fuel alternative that they can buy on credit. Armed with this new technology, Condor is making the most of their cashew production, both as a business and as a community. TechnoServe worked with Nasir Mohammed Hulling Station to implement innovative best practices that benefit employees and farmers alike. In East Africa, the coffee industry is also converting a waste problem into a benefit for coffee-producing communities. A vital part of coffee processing takes place at a hulling station, a centralized collection center where the coffee bean is separated from its husk layer. Through the hulling process, large amounts of fibrous husks accumulate, which can contaminate local waterways and create a serious safety hazard. 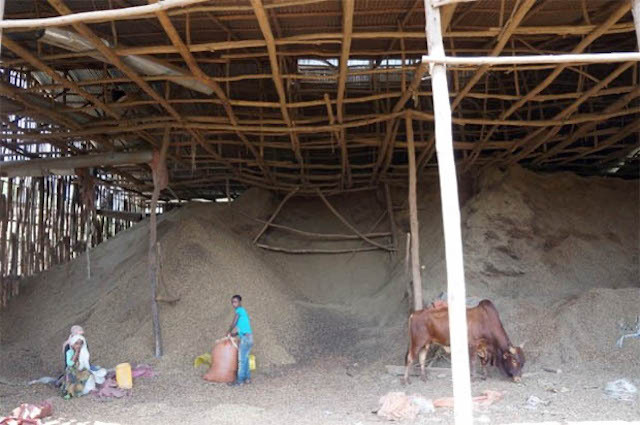 In Agaro, Ethiopia, the Nasir Mohammed hulling station felt the consequences of this problem when their husk waste caught fire, burning down the warehouse and all their machinery. But now, the hulling station has turned its husk processing problem into a coffee production solution. By partnering with TechnoServe’s JDE Origins Program, Nasir Mohammed took part in a two-year training series on hulling station management. TechnoServe worked with the station’s staff to adhere to higher sustainability, occupational health and safety, environmental responsibility, economic transparency, and bookkeeping standards. 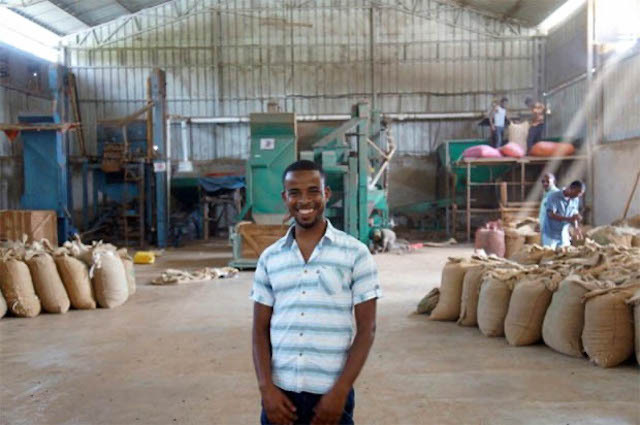 Project business advisors also helped bring to life a strategic husk management model through which Nasir Mohammed began to deliver its husk waste to local farmers, who could use it as mulch on their coffee farms. Now, these farmers can take advantage of an unused byproduct to help increase their harvests, all the while eliminating the risk of pollution by a business that is essential to their community’s coffee economy. TechnoServe is working with hulling stations in Agaro, Ethiopia, to transform coffee husks from a safety risk into a bumper crop for local coffee farmers. The husk management model has so far successfully distributed more than 1,000 metric tons of husk to local farmers from eight private hulling stations. With new access to mulch, local coffee growers have seen improved yields. The positive impact of the byproduct was almost immediate, as Agaro coffee farmer Misbahu describes, “A year ago, my trees were exhausted; but after applying mulch, my trees have grown more leaves… and are producing more stable volumes than before.” By supporting local coffee growers, hulling stations are essentially reinvesting in their supply chain, increasing business, and creating a sustainable cycle for growth within the coffee community. What were formerly dangerous stockpiles are now an avenue for growth, showing that with some careful planning and a little help, waste can be transformed into opportunity. Explore how TechnoServe is working to turn another cashew byproduct, the cashew apple, into a new industry in Benin.